In recent weeks it seems like global tensions are increasing constantly. Only days after Benjamin Netanyahu’s press conference attack on Iran, Donald Trump tore up the US copy of the Iran nuclear agreement, only hours later Israel launched its missile strike in Syria, with warplanes hitting Iranian sites around Damascus. Defence Minister Ursula von der Leyen. Netanyahu called it a reprisal for Iranian military attacks against Israeli positions on the Golan Heights a day earlier. Some observers noted that Israel has frequently fired into Syria in recent months and that international law and UN decisions view the Golan Heights as part of Syria, though occupied by Israel since 1967. With the Trump-Netanyahu love-knot holding tight, both are hunting for chances to hoist war banners, evoke patriotic unity and thus keep their very shaky thrones. And now the Gaza shootings – and the Jerusalem embassy provocation. My thoughts return involuntarily to Hiroshima. What about Germany, the central pillar of an also shaky but still very important European Union? It can play a crucial role in this balancing act. Since its creation after 1945 it has always been a faithful associate – some say a vassal – of US big business interests; massive trading with entwined investment and military partnership have never been questioned. Big German auto-makers established themselves in the US, most happily in southern states with no union interference; the war criminal BASF firm continues to spread chemicals along the US Gulf coast, Aldi and Lidl have taken their rivalry to the US while Amazon is pushing out retailers and exploiting employees in Germany as energetically as McDonald’s and Burger King have been doing for years. The Deutsche Bank is busy as ever on both sides of the Atlantic. Trans-Atlantic glue is strong, however, and US trade is a very big stick. Powerful interests support lasting “trans-Atlantic ties” while Defence Minister Ursula von der Leyen keeps plugging her campaign to meet US-NATO demands for soaring military spending. 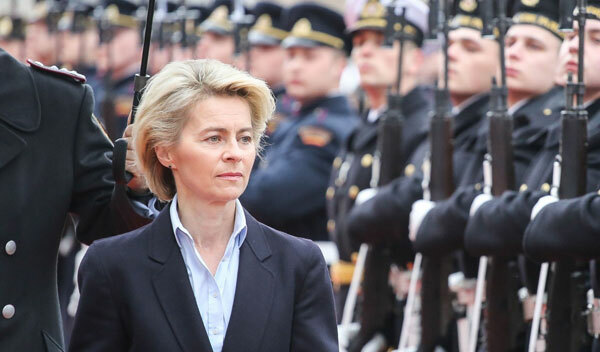 The German Bundeswehr is never modern enough for her, its firepower within Germany, Europe (at Russian borders) and abroad from Mali or Niger to Afghanistan and Syria never suffices for what she calls German “responsibility” as a world power. Barely hidden behind her snappy appeals for tanks, planes or drones are the grasping, gauntleted fists of Raytheon and Lockheed, Rheinmetall and Thyssen-Krupp. Syria and Iraq are largely ruined but the plains, mountains and cities of Iran beckon more temptingly than ever after the breach of the Iran treaty and Sheldon Adelson, the multibillionaire casino mogul and a power behind both Trump and Netanyahu, has opposed treaties with Iran for years. But in Germany other forces have been re-investing in Iran and yearn to normalise trade with Russia. Airbus planes for Tehran airlines, chemicals, machines, fruits and vegetables for Russia – all kinds of products were sold there until the US-commanded sanctions cut the stream to a trickle. Will all of Trump’s tariff war, his demands for NATO rearmament, his climate control withdrawal and the abrogation of the Iran treaty, end up with European capitulation or resistance? Many mixed signals – including Merkel’s occasionally surprising criticism of Trump policy – signal a tug-of-war in the panelled skyscrapers of Frankfurt, Munich and Hamburg where policies are cooked up. Richard Grenell, the new far-right US ambassador to Berlin, forgot any diplomacy and threatened in a tweet: “German companies doing business in Iran should wind down operations immediately.” The same embargo screws used for decades against anyone trading with Cuba could be very painful. But at first Western European leaders criticised Trump’s decision to scrap the nuclear deal and pledged to uphold their side of the agreement. Despite all talk about Trump’s supposed ties to Vladimir Putin, US sanctions and hostility towards Russia and Iran have a good chance of prevailing. One German foreign minister, Frank-Walter Steinmeier, who had offered a few rays of hope for less one-sided obedience, was kicked upstairs to the largely ceremonial job of president. His successor, Sigmar Gabriel, after wavering hesitantly toward detente, was also ejected – not up but out altogether! Heiko Maas, the new foreign minister, a Social Democrat, has thus far displayed an inclination to move further rightward than even see-sawing Angela Merkel. His Moscow meeting, arranged only after he had jumped aboard every available anti-Russian wagon, was unsurprisingly a flop. But unless all signatories hold together the Iran treaty is lost, regardless of the consequences. And Theresa May is already slithering westward. Resistance has not been a strong point of the Social Democratic Party (SPD) but, with its poll figures dipping to a shocking all-time low of 18 per cent, its members are restless. Simone Lange, the little-known mayor of northern Flensburg, and who grew up in the GDR, took positions well to the left of party officialdom. The treatment she got was much like that given Bernie Sanders by the US Democratic Party. But the SPD was not the only party facing inner conflict. Die Linke (the Left), before its congress in Leipzig, is still torn, especially between those supporting co-chair Katja Kipping and those backing Sahra Wagenknecht, co-chair of the Die Linke caucus in the Bundestag. Many issues are at stake. Anti-refugee rhetoric is a main tool of the Alternative for Germany (AfD) and its fascistic allies, also some in Merkel’s so-called Christian Union parties, especially in Bavaria. It has shoved the country alarmingly to the right. The usually more leftist Wagenknecht has unexpectedly implied that Germany should accept no more people from abroad than the central government is willing to assist, without overburdening towns and cities at the expense of local working people. She has also accepted the expulsion of those found to be criminal. Also being debated is a call by Sahra and her husband Oskar LaFontaine for a broad movement, similar to that of Jean-Luc Melenchon in France, to stem the fascist tide. Correctly or not, this idea’s opponents suspect an attempt to somehow circumvent and thus weaken Die Linke with a possible rival. But the party, stuck at 9-10 percent in the polls, has thus far hardly reached disappointed or worried voters and non-voters who turn to the AfD as the only “anti-establishment” party. Can some new movement, joining Die Linke supporters with SPD rebels and the rightward-drifting Greens, turn the tide? We will know more during the Leipzig congress. The basic Die Linke dispute is between those working to improve life for the citizenry as members of state governments, and those further left who reject the capitalist social system. Such rejection means opposition to the leadership of all other parties, with no compromises on major questions like foreign deployment of the Bundeswehr. Is this old-fashioned, dogmatic and self-defeating, or a necessity if Die Linke is to remain true to itself? Which path can best achieve the two main tasks of fighting the growing fascist threat and opposing any move towards war in Syria, Iran, Ukraine or elsewhere? The Leipzig congress in early June may be a stormy one – and a crucial one.